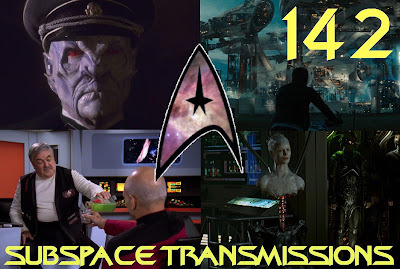 Is it possible to name every single iconic Star Trek moment in a lone podcast hour? The answer, it appears, is a very loud 'NO!!!' Therefore this week hosts Cam Smith and Tyler Orton are back to induct more all-time legendary franchise highlights into their own personal hall-of-fame canon. From lengthy shuttle trips around the Enterprise, to unforgettable final (?) farewells and Nazi Aliens from Space, the duo attempt to right past wrongs by recognizing some of their previous list's most egregious and unforgivable exclusions. Wanna appear on the show? Shoot us a 30 to 60-second audio clip telling us what you think are STAR TREK'S MOST ICONIC MOMENTS and you could take the spotlight in an upcoming program! You can also send any other questions, topic ideas or feedback to subspacetransmissionspod@gmail.com! Join us next week as we ponder the current state of the franchise.